Powters are one of the longest established sausage makers in the UK and they’ve provided their Newmarket sausage since 1881 when Grant Powter’s family first started making sausages in the town. The reason their recipe has stood the test of time is that it’s a good reliable sausage and over time some additions (such as pork and ale) have complemented the range. The tricky thing with coming up with a whole new range, when you are already known around the World for your quality, is making something new which measures up. 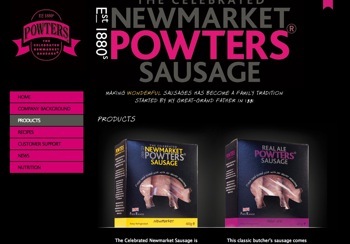 New flavours, which will be joining the Powters celebrated Newmarket sausage, Powters 1881 sausage, and family favourite Powters Chipolata sausage, include Cider and Sage, Gluten-free, Low-fat, Spicy Spanish, and Real Ale. With their new range Powters have certainly kept up the standard. Powters have managed to compliment their previous sausages but they also build on that quality. Their low-fat sausage, for example, is another great addition to the range and allows access to a high quality product for those also watching the calories. A favourite for me was the Spicy Spanish. The quality of the ingredients is clearly high and because the sausage is well balanced this really comes through. It was spicy but not overpoweringly so and had I tried this before I wrote my list of top 20 I think it would have been on there. The chipolates were also a big hit in our house not least with the three year old “Sausage Prince”. I love the versatility of these good sausages. We had some decent sausage sandwiches with the chipolates but equally we could have put them with cheesy mash or in a toad in the hole! Each bite convinced me that I need to go back to Newmarket for another Sausage King Adventure and visit Grant and his team. 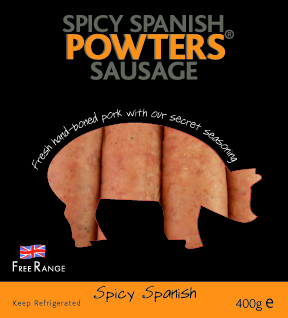 I don’t normally make a specific mention of a sausage maker’s website but in the case of Powters I want to point it out because I think it must be one of the nicest looking, informative and yet simple websites I’ve seen. You can, of course, order your sausages online there and also learn more about the products.